Elisabeth Grüttefien-Kiekebusch (1871-? 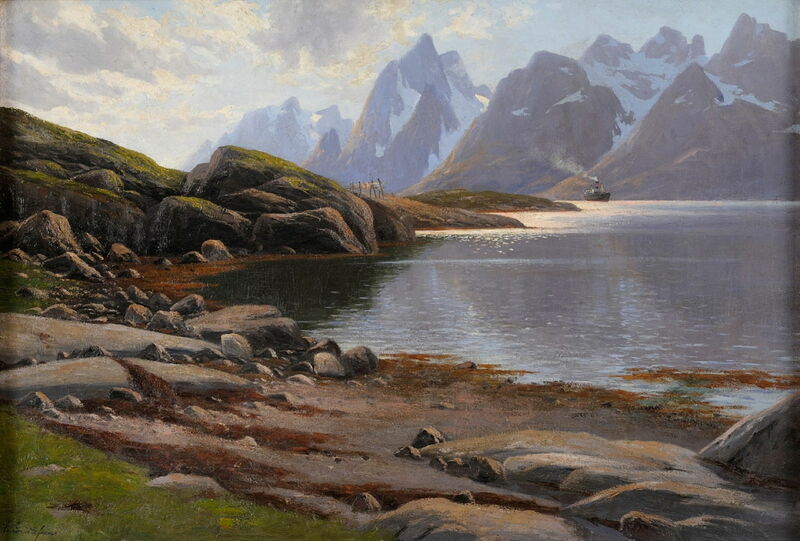 ), Fjord Landscape (date not known), oil on canvas, 80 x 120 cm, Private collection. Wikimedia Commons. When Edvard Munch was invited by the Norwegian landscape painter Adelsteen Normann (1848-1918) to visit Berlin and exhibit his controversial paintings there, he felt honoured and encouraged. In his late twenties, he was flattered that this established artist should even think about inviting him, and delighted that he was to put his work before the famous artists and hopefully more sophisticated public in Berlin. 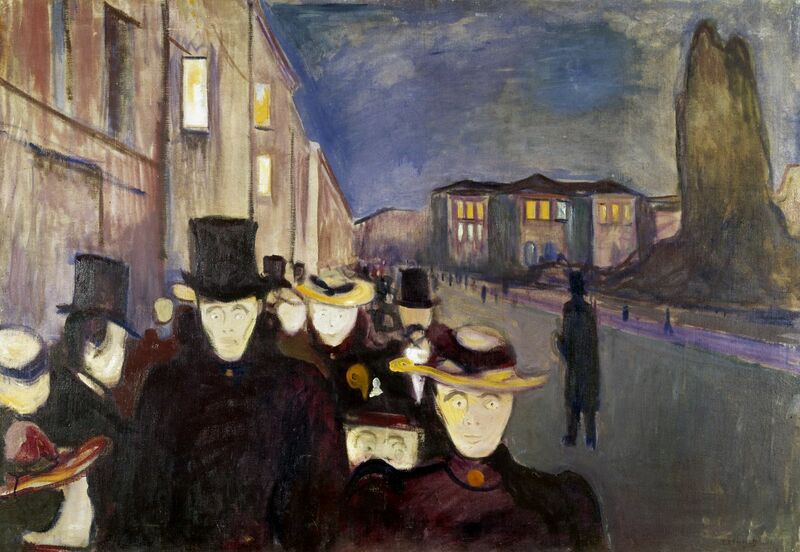 Munch had just finished painting his Evening on Karl Johan (1892), then still known simply as Evening. Set on the main street in Norway’s capital city, it looks from the Royal Palace towards Storting (the parliament building) with greatly foreshortened perspective to pack the pedestrians together and instill a deep sense of anxiety. This refers to an episode during Munch’s earlier affair with ‘Mrs Heiberg’, in which he was anxiously waiting for her. On 20 October, Edvard Munch loaded his paintings into a train, and set off for the great city of Berlin. When the exhibition of the Verein Berliner Künstler opened there in November, his work was considered so shocking that it provoked outrage, and the exhibition had to close prematurely after only one week. Munch almost relished the reaction, and the exhibition went on to later showings in Düsseldorf and Cologne before returning to Berlin. Munch stayed on in the city with his new-found friend Adelsteen Normann, and joined the literary and arts circle around the Swedish playwright August Strindberg which met in the ‘Black Piglet’ tavern. This gave Munch the opportunity to develop the series of psychologically dramatic paintings which were to become his Frieze of Life. Munch had already painted his first version of Despair in early 1892, when he was staying with the Norwegian painter Christian Skredsvig in the south of France. This slightly later version is higher in chroma than that, and features a different background figure. Although neither version was painted when he was in Oslo, they both show a blood-red sunset view from the same location above the city of Oslo, and the same vessels are shown at anchor in the fjord. 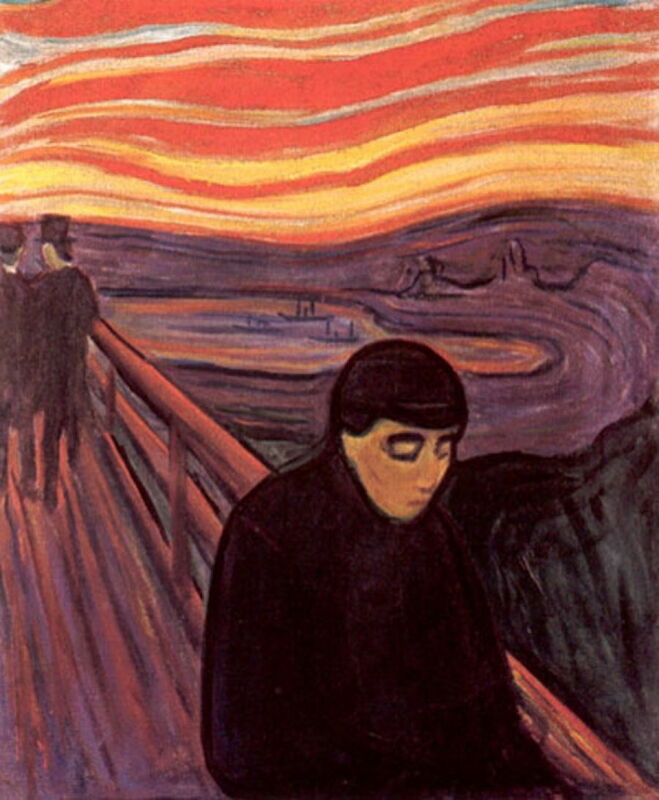 From Despair came The Scream, shown here in its first version of 1893, painted using a mixture of oils, tempera and pastel on cardboard. 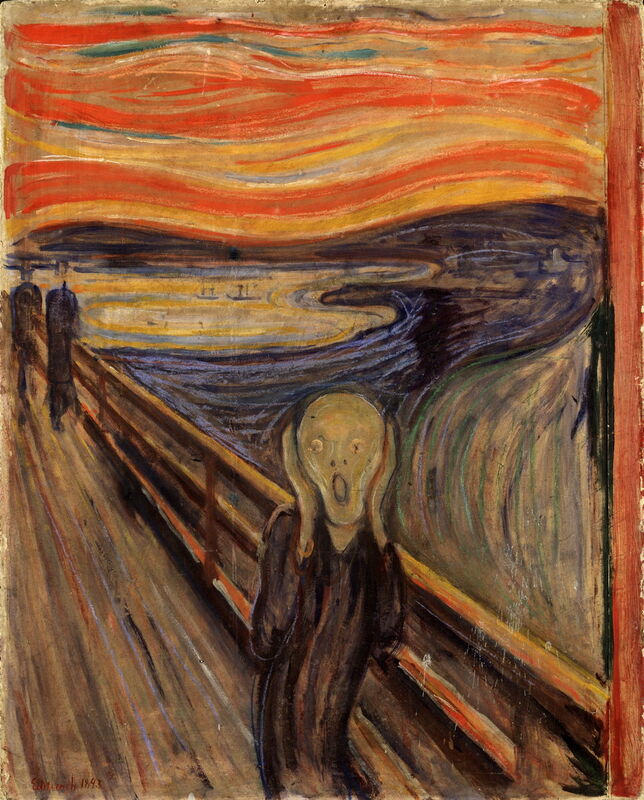 This is the first of several different versions of The Scream, which include the same background as in Depair (1894). Munch talked about building these and other paintings into a ‘symphony’ in early 1893, when still in Berlin, and at the end of that year exhibited there his first self-contained series of images, under the title A Human Life. He then returned to Norway in the Spring of 1894, and had a solo exhibition in Oslo in October 1895. 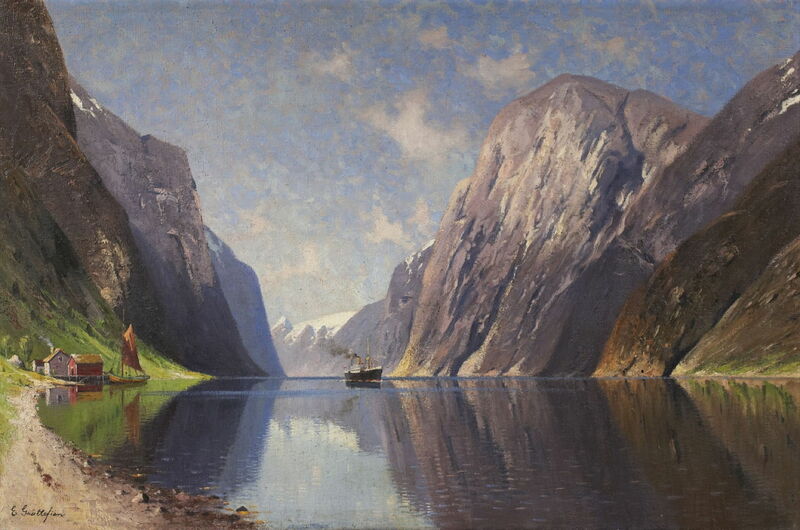 After Munch moved on with what is now one of the most famous paintings and images in the western world, and had changed the history of art, his friend Adelsteen Norman returned to painting Norwegian fjords for his customers in Berlin. This selection is of the undated examples that I have found. 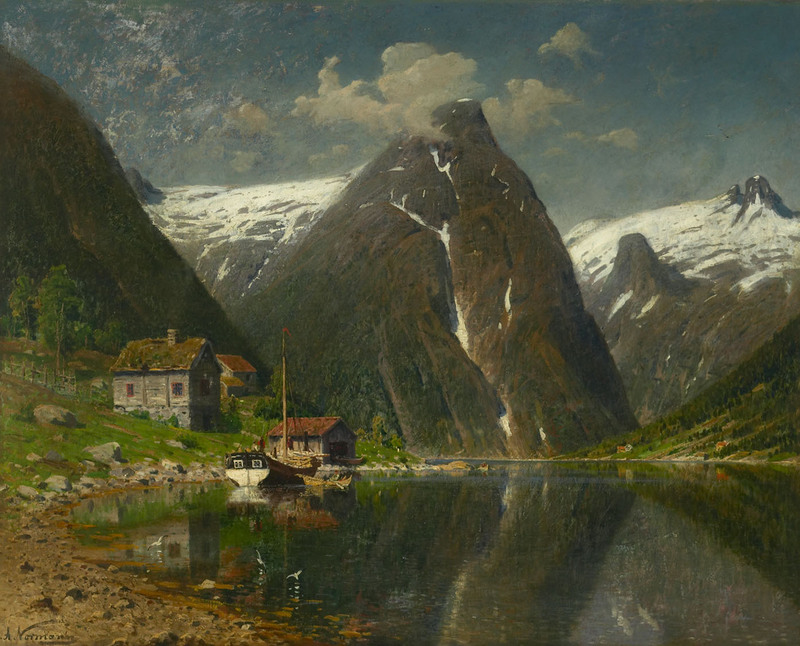 Eilert Adelsteen Normann (1848-1918), Munken gård in Esefjorden (date not known), oil on canvas, dimensions and location not known. Wikimedia Commons. Munken gård in Esefjord was painted on the shore of this tributary to the mighty Sognefjord, in the south-west of Norway. Eilert Adelsteen Normann (1848-1918), The Steamship (date not known), further details not known. Wikimedia Commons. 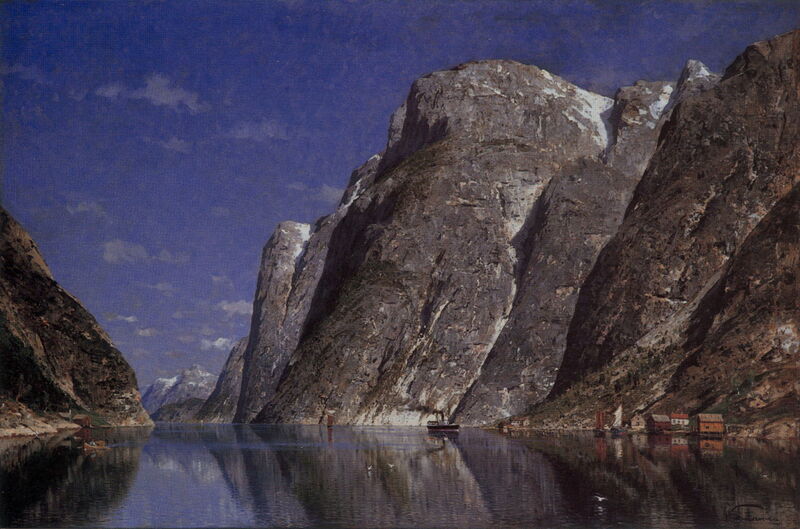 One of the regular passenger and cargo ferry services steams up an unidentified fjord in Normann’s The Steamship. Eilert Adelsteen Normann (1848-1918), Sognefjord, Norway (date not known), further details not known. Wikimedia Commons. Sognefjord, Norway shows the country’s longest and deepest fjord, which carves its way due east from the southern bulge of the coastline. This view features Normann’s favourite small craft, and the sky and rock have become very painterly. 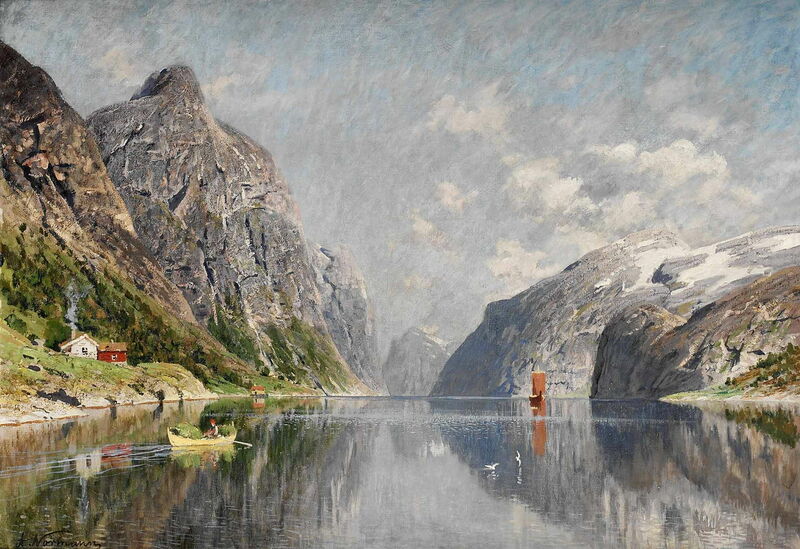 Eilert Adelsteen Normann (1848-1918), Norwegian Fjord (date not known), oil, dimensions and location not known. Wikimedia Commons. 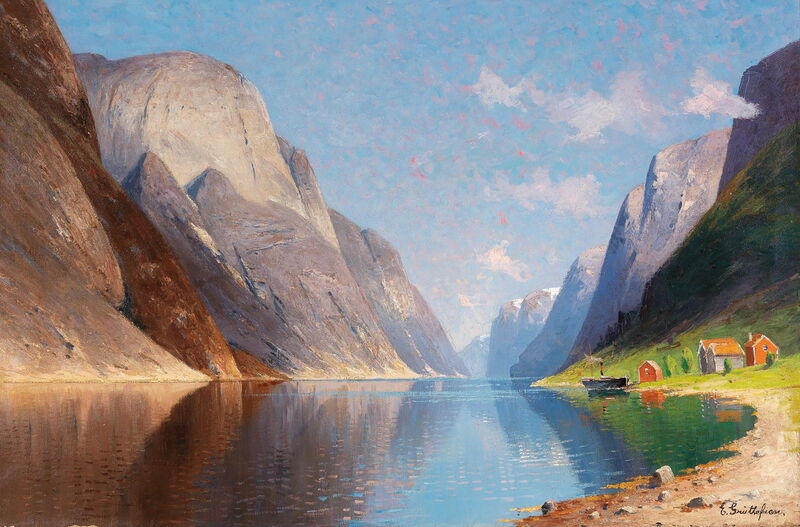 Norwegian Fjord may well be another view of Sognefjord, with similar boats on its slightly rippled mirror surface. Eilert Adelsteen Normann (1848-1918), From Hardanger (date not known), media and dimensions not known, Norsk Maritimt Museum, Oslo, Norway. Wikimedia Commons. From Hardanger most probably shows Hardangerfjord, which drains the glaciated Hardangervidda plateau in central south-west Norway, emptying into the sea to the south of Bergen. The steamship appears to be one of the early cruise ships, which started to take tourists – some no doubt inspired by Normann’s paintings – around the coast of Norway during the late nineteenth century. Its flotilla of little steamboats is busy ferrying the visitors to the shore. Eilert Adelsteen Normann (1848-1918), Sailing on the Fjord (date not known), further details not known. Wikimedia Commons. Sailing on the Fjord shows leisurely boating on an unidentified fjord. During the later 1890s, Adelsteen Normann also taught other artists, among them a young woman from Kettwig in Germany’s Ruhr valley, Elisabeth Grüttefien. Born in 1871, she was so moved by Normann’s paintings of Norway that she too travelled there each summer to paint them. 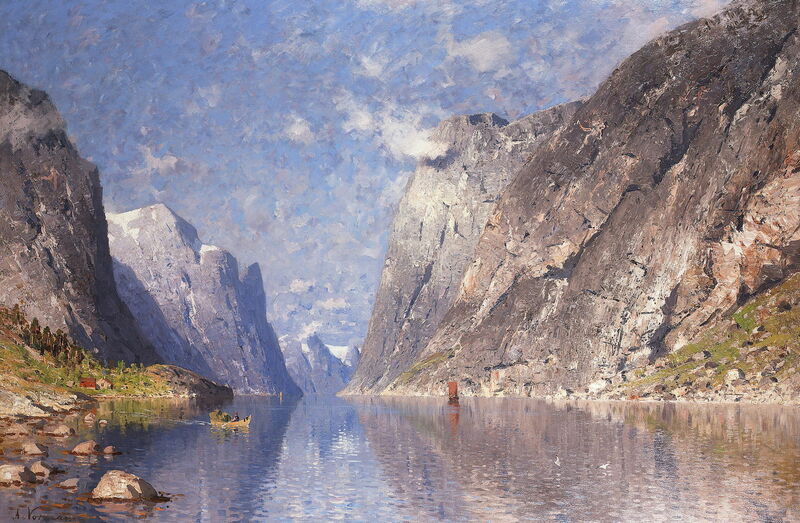 Clearly inspired by Normann’s views of the fjords, Grüttefien’s style is quite distinct, as shown in her undated Fjord Landscape. Her greens are more vibrant, and there are some fluffy red patches in her blue sky. Elisabeth Grüttefien-Kiekebusch (1871-? ), Fjord with steamer (c 1900), further details not known. Wikimedia Commons. 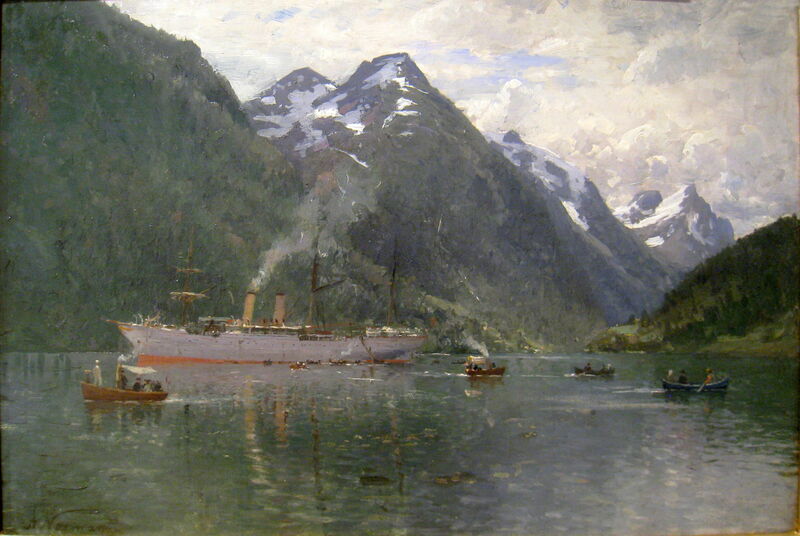 In her Fjord with Steamer from about 1900, she includes a sailing boat and one of the larger steamships, just as would have appeared in Normann’s paintings. Elisabeth Grüttefien-Kiekebusch (1871-? 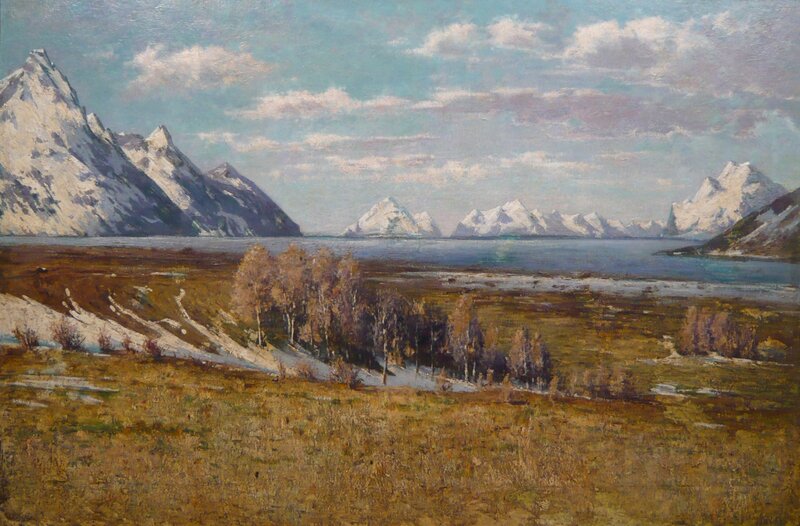 ), Fjord Landscape (c 1900), further details not known. Wikimedia Commons. Grüttefien also found some different motifs. In Fjord Landscape, also from about 1900, it is spring, and there is still plenty of snow left from the winter. Groups of birch trees have yet to come into leaf. Elisabeth Grüttefien-Kiekebusch (1871-? ), In Raftsund at Digermule (c 1900), further details not known. Wikimedia Commons. 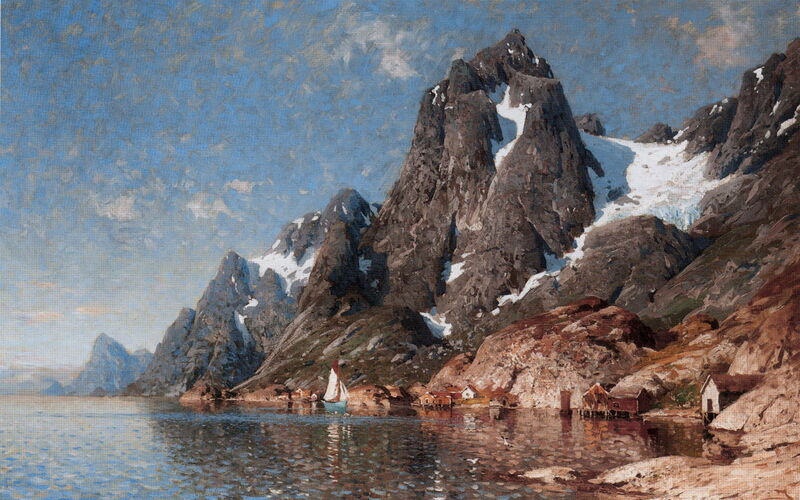 In Raftsund at Digermulen (c 1900) is a view of the strait between the islands of Hinnøya and Austvågøya, near the Lofotens in the far north. Its rocky beach is strangely reminiscent of Dücker’s earlier paintings of the Baltic coast. Elisabeth Grüttefien also painted in the Alps, although I have been unable to locate images of any of those works. In 1903, she married Hermann Kiekebusch, and the two of them spent their summers painting in the Norwegian fjords or high Alpine meadows. They worked from a joint studio in Berlin, but both seem to have vanished without trace. I have been unable to discover even the years of their deaths. Posted in General, Life, Painting and tagged Dücker, Grüttefien-Kiekebusch, history of painting, landscape, Munch, Normann, painting. Bookmark the permalink.